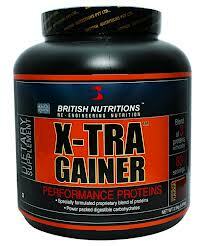 X-TRA GAINER™ is an excellent nutrient mixture of Whey protein, soy and milk protein. This combination helps in maintaining the protein balance, protein synthesis and protein breakdown. X-TRA GAINER™ also provides the body with easily digestible carbohydrates, essential amino acids and Branched Chain Amino Acids (BCAAs), Vitamins & Minerals. If you are looking for an ideal nutritional support to boost muscle mass and strength, all you need is British Nutritions X-TRA GAINER™. X-TRA GAINER™ provides you with ideal nutritional support to help you boost muscle mass and gain strength. Important components in the X-TRA GAINER™, like Isoflavones and Branched Chain Amino Acids (BCAA's) helps in reducing fat percentage and assists the building of lean muscle mass at a faster pace. The perfect proportion of carbohydrates and protein supports repair, rebuild and supply energy to body tissues. X-TRA GAINER™ also provides the body with adequate amounts of micro-nutrients like Vitamins and Minerals to support metabolic function, boost immune system and acts as antioxidants. Unbelievable price on X -TRA GAINER in Mumbai (India) company Euphoria Healthcare Pvt. Ltd..